Test Stations are made for monitoring buried items and providing an outlet to alter or manipulate chemical reactions taking place between metal objects and surrounding soil. ProMark manufactures a complete line of Cathodic Protection Test Stations and Accessories. All cathodic protection Test Stations are manufactured and assembled in the USA. Cathodic Protection Test Stations are made from high impact strength, non-conductive and UV protected polycarbonate. ProMark offers a lifetime warranty on all Test Stations. 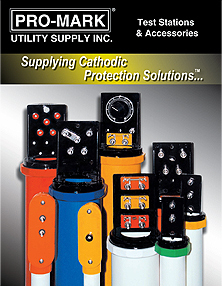 Cathodic Protection Test Stations are in stock in all standard colors.